Severe obesity is associated in with increased systemic arterial pressure (1), high renal plasma flow (2–4⇓⇓), increased GFR (2,5⇓), and enhanced albumin excretion rate (6,7⇓). We have previously studied glomerular hemodynamics in patients with severe obesity by measuring the fractional clearances of dextrans of broad size distribution (8). Analysis of the dextran sieving data, using a theoretical model of macromolecule transport through a heteroporous membrane, showed that the glomerular capillary bed was subjected to an elevated transcapillary hydraustatic pressure gradient resulting in hyperfiltration. In addition to these physiologic abnormalities, many reports have associated obesity with the occurrence of nephrotic syndrome and renal failure (9–19⇓⇓⇓⇓⇓⇓⇓⇓⇓⇓). Obesity-related glomerulopathy was recently defined morphologically as glomerulomegaly with or without focal segmental glomerulosclerosis (20). Obesity may also accelerate the course of idiopathic glomerular disease, such as IgA glomerulopathy (21). The prevalence of obesity-related glomerulopathy, which may lead to end-stage renal disease, has increased tenfold over the last 15 yr as a consequence of “the spread of the obesity epidemic” (22). Although a cause-and-effect relationship between the obesity-associated glomerular hyperfunction and the development of nephrotic syndrome and renal failure has not been demonstrated, experimental and clinical data suggest that hyperfiltration and glomerulomegaly may lead to glomerular damage. Therefore, reducing glomerular hyperfiltration may provide a way to prevent or delay the development of renal disease in the obese. The aim of the present study was to examine whether weight loss might reverse glomerular dysfunction in obese subjects without overt renal disease. Seventeen volunteers, ten women and seven men, aged 23 to 46 yr participated in the study. Eight subjects had severe obesity (body mass index [BMI] > 38), and nine were non-obese, healthy subjects, who served as a control group. All participants denied a history of renal disease. None were treated for hypertension, diabetes mellitus, or any other chronic disease. All were found to have a normal serum creatinine level and a negative dipstick test for urinary protein. Table 1 shows the characteristics of the two groups. Age and gender distributions were similar in the two groups. The body weight of the obese group was more than twice the weight of the control group. BMI of the obese subjects varied between 38.1 and 61.3, with all but one having morbid obesity, as defined by a BMI above 40. The systolic and diastolic arterial pressure of the obese subjects was 143 ± 6 mmHg (range, 122 to 173 mmHg) and 80 ± 3 mmHg (range, 66 to 92 mmHg), respectively. One subject had stage 2 hypertension (systolic and diastolic), and four had stage 1 hypertension (systolic only). None had ever been treated for hypertension. Three were normotensive. The systolic and diastolic arterial pressure of the control group was 120 ± 2 mmHg (range, 108 to 129 mmHg) and 70 ± 3 mmHg (range, 56 to 82 mmHg), respectively. Patients underwent an oral glucose tolerance test (OGTT) and renal function tests. The OGTT was performed at 8 a.m. after a 10-h fast. The subjects ingested 75 g of glucose dissolved in water. Blood samples were withdrawn through an indwelling intravenous catheter 10 min and 1 min before and 60 and 120 min after the ingestion for measurement of plasma glucose and insulin. Urine samples, obtained 1 wk before renal function tests were performed, were assayed for urea, creatinine, and sodium concentration. Renal function tests were performed 4 to 5 d later in all subjects. Each subject was studied at 8 a.m. after a light breakfast low in protein content. The subjects were kept recumbent in a hospital bed, and intravenous catheters were placed in each upper limb for infusion of clearance markers and blood sampling. A priming dose of inulin (50 mg/kg), p-aminohippuric acid (PAH) (8 mg/kg), and dextran 40 (130 mg/kg) was administered. Inulin, PAH, and dextran 40 were thereafter infused continuously. A water load (15 ml/kg) was given during the first 60-min prime. Four accurately timed urine collections were then obtained by spontaneous voiding. Peripheral venous blood was drawn to bracket each urine collection. BP was measured during each urine collection. The obese patients underwent gastroplasty 1 to 3 wk after performance of the renal functions tests. Renal function tests and oral glucose tolerance tests were repeated at least 12 mo after surgery using the same protocol. The nine control subjects and six of the eight obese subjects were part of a larger group recruited for the study of glomerular hemodynamics in obesity (8). Dextran 40, a dextran solution of broad size distribution, was administered for the measurement of sieving coefficients of macromolecules to all participants, obese subjects, before and after weight loss, and control subjects. The analysis of the sieving coefficients of dextran in the control group and in the obese group before surgery was the subject of our initial report (8). Serum and urine dextran concentrations were not measured after weight loss. However, the dextran solution was administered to maintain standard conditions during the studies before and after weight loss. Plasma and urinary concentrations of inulin and PAH were analyzed by colorimetric methods (23,24⇓). Plasma glucose, serum albumin, serum pre-albumin, serum transferrin, blood total lymphocyte count, and urine urea, creatinine, and sodium were measured using standard laboratory methods. Serum insulin was measured using a RIA (Sorin-Biomedica, Saluggia, Italy). Urine albumin was measured by nephelometric methods (Beckman, Galway, Ireland). GFR was determined from the average inulin clearance. RPF was calculated by dividing the average PAH clearance by an assumed renal PAH extraction ratio of 0.9. The urine urea/creatinine ratio (mg/mg) and the urine sodium/creatinine ratio (mEq/mg) were used to estimate the change in protein and sodium intake after weight loss. Mean arterial pressure was calculated as diastolic pressure plus one third of the pulse pressure. BMI was calculated as: BMI = BW/H2, where BW is the body weight expressed in kg and H is the height expressed in m. OGTT was analyzed by calculating the area under the glucose and insulin curves. Changes in GFR (ΔGFR), BMI (ΔBMI), area under the glucose and insulin curves (ΔAUCgluc and ΔAUCins), and in systolic BP (ΔSBP) after weight loss were expressed as % change from baseline. Normally distributed data are expressed as mean ± SEM. Variables with skewed distribution, such as urinary albumin excretion rate and fractional albumin clearance, are expressed as median (range). The significance of differences between the obese and control groups was evaluated by a two-tailed t test. The significance of differences between the obese group before and after weight loss was evaluated by a paired two-tailed t test. t test was applied to non-normally distributed data after log transformation. Potential relationships between ΔGFR (dependent parameter) and ΔBMI, ΔAUCgluc, ΔAUCins. and ΔSBP (independent parameters) were analyzed by linear regression (univariate analysis). Multivariate analysis was performed with logistic regression using forward stepwise selection. Informed consent was obtained from all participants. The study was approved by the local Ethics Committee. Obese patients lost 48 kg within 12 to 17 mo, from 145 ± 9 to 97 ± 7 (P < 0.0005), and BMI decreased by 16 units, from 48 ± 2.4 to 32.1 ± 1.5 (P < 0.0001). Despite this decrease, BMI remained well above normal (control group: 22.2 ± 1.7, P < 0.0001). Table 2 summarizes the results of the OGTT. Fasting blood glucose was higher in the obese group compared with the control group, all values being below 140. Fasting insulin was elevated almost threefold in the obese group. The area under the glucose and the insulin curves in the obese group were increased by 80 and 250% respectively, as compared with the control group. The ratio of the insulin-to-glucose area under the curves of the obese group was increased by 85%, suggesting insulin resistance. After surgery, fasting serum glucose and the area under the glucose and insulin curves decreased significantly. The ratio of the insulin-to-glucose area under the curves decreased by 32%, reaching a value 27% above the normal. These data are consistent with improvement in insulin resistance. The urine urea/creatinine ratio decreased from 17.1 ± 1.9 to 11.8 ± 1.3 (P < 0.05) after weight loss. The urine sodium/creatinine ratio decreased from 0.16 ± 0.01 to 0.12 ± 0.02 (P < 0.05). Serum albumin was 4.2 ± 0.1 before surgery and 4.3 ± 0.1 mg/dl after weight loss (P = NS). 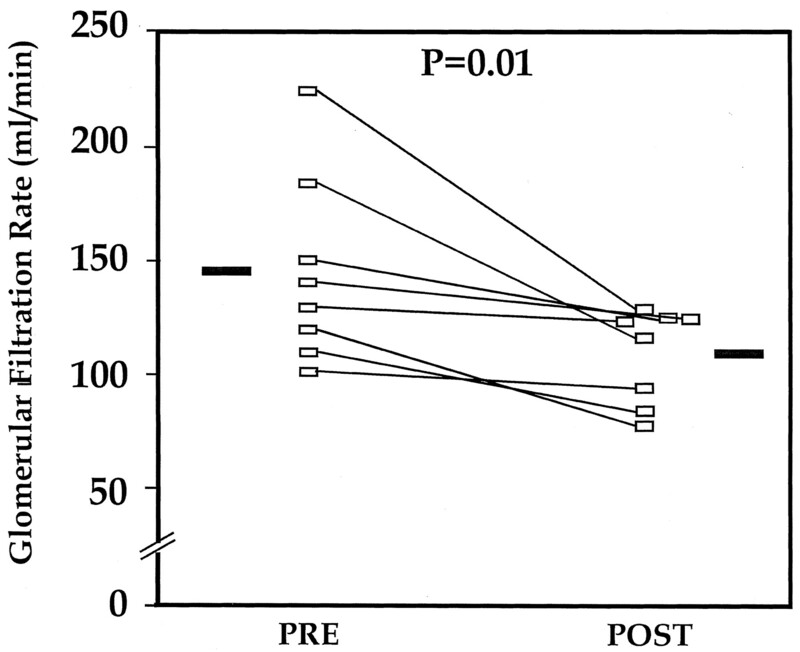 Serum pre-albumin was 27.3 ± 3.1 before surgery and 25.3 ± 1.0 mg/dl after weight loss (P = NS). Serum transferrin was 312 ± 13 before surgery and 314 ± 21 mg/dl after weight loss (P = NS). Total blood lymphocyte count was 1946 ± 186 before surgery and 1728 ± 146/mm3 after weight loss (P = NS). Filtration dynamics and arterial pressure data are shown in Table 3. In the obese group, systolic arterial pressure was in the high-normal range. Diastolic and mean arterial pressures were normal. However, these values were higher than those of the control group. GFR was 61% higher in the obese than in the control group. It was elevated in six of the eight patients. The increase in RPF was proportionally smaller, averaging 32%. The increase in GFR was thus associated with an increase in filtration fraction. After weight loss, GFR and RPF decreased by 24% and 13%, respectively (Figures 1 and 2). Systolic pressure decreased by 10 mmHg, diastolic pressure remained unchanged, and mean arterial pressure decreased nonsignificantly. Figure 1. GFR in the obese group before and after weight loss. Figure 2. RPF in the obese group before and after weight loss. After weight loss, albumin excretion rate decreased from 16 μg/min (4 to 152 μg/min) to 5 μg/min (3 to 37 μg/min) (P < 0.01), and the fractional clearance of albumin decreased from 3.2× 10−6 (1.1 to 23× 10−6) to 1.2× 10−6 (0.5 to 6.8× 10−6) (P < 0.02). Predictors of the Changes in GFR By univariate analysis, ΔGFR correlated with ΔAUCgluc (r = 0.76, P < 0.03). The correlation between ΔGFR and ΔBMI approached significance (r = 0.69, P = 0.059). ΔAUCins (r = 0.33, P = NS) and ΔSBP (r = 0.37, P = NS) were not predictors of ΔGFR. By multivariate analysis, joining ΔSBP to ΔAUCgluc resulted in an increased correlation with ΔGFR: r = 0.95, P = 0.01. This study shows that the renal hemodynamic abnormalities associated with severe obesity, i.e., augmented GFR, RPF, and albuminuria, improve substantially after weight loss. It has been previously shown (2–4,8⇓⇓⇓) that obesity-associated hyperfiltration is associated with a high RPF, suggesting a state of renal vasodilatation involving, mainly or solely, the afferent arteriole. The obese group had a higher systolic pressure and mean arterial pressure than the control group. We have previously analyzed the glomerular sieving data of macromolecules, using a heteroporous model of glomerular size selectivity (8), in a group of 12 extremely obese subjects, which included six of the eight patients studied in the present study. This analysis showed that an increased transcapillary pressure gradient accounts for the increased GFR, the increased glomerular pressure being due to the transmission of an increased arteriolar pressure through a dilated glomerular afferent arteriole. After weight loss, GFR, RPF, and filtration fraction decreased markedly. RPF normalized while GFR remained slightly elevated. This improvement was associated with a decrease in albuminuria. This decreased albuminuria was not solely due to a decrease in GFR, as shown by the decrease in the fractional albumin clearance. The present study is the first to show that GFR, RPF, and microalbuminuria all decrease after weight loss in obese subjects. In the only study previously published on the effects of weight loss on renal function, Brochner-Mortensen et al. (5) demonstrated that GFR decreases after intestinal bypass surgery in obese subjects. However, in that study, no data were provided regarding renal blood flow, arterial pressure, and albuminuria. Furthermore, the state of malabsorption associated with intestinal bypass surgery often leads to marked malnutrition. In the present study, the patients underwent gastroplasty and did not manifest biochemical signs of malnutrition after weight loss. We wish to emphasize that the GFR in the present study has not been corrected for body surface area. The number of nephrons does not increase with increasing body fat; therefore, increasing obesity must result in an increase in the single nephron GFR. Absolute GFR reflects this phenomenon, whereas correcting GFR for body surface area obscures it. We have accordingly analyzed the data by using the uncorrected, absolute GFR. What are the long-term consequences of the improvement in the hemodynamic properties of the glomeruli? Obesity-related glomerular disease was first reported almost three decades ago by Weisinger et al. (9). Since then, numerous reports have been published (10–20⇓⇓⇓⇓⇓⇓⇓⇓⇓⇓). This glomerulopathy often presents as nephrotic syndrome, with or without renal failure. The prevalence of glomerular disease in the obese is unknown. A recent publication reported that the prevalence of obesity-related glomerulopathy, morphologically defined as glomerulomegaly with or without focal segmental glomerulosclerosis, has increased tenfold over 15 yr (20). Its pathogenesis is unascertained. However, considering that the glomeruli of patients with severe obesity are subjected to an elevated transcapillary filtration pressure gradient and to an elevated filtration rate (8), it is tempting to speculate that these physiologic abnormalities underlie glomerular damage. Brenner et al. (25,26⇓) suggested two decades ago that adaptive glomerular changes occur after reduction in functional renal mass and that these changes underlie the initiation and progression of glomerular sclerosis. Glomerular hyperperfusion, hyperfiltration, and hypertension lead to stretching of the glomerular capillary wall, injury to endothelial and epithelial cells, and transudation of macromolecules into the mesangium (27). This results in mesangial overload and dysfunction (28,29⇓) and evolves with time to mesangial expansion and sclerosis (30). This mechanism, supported by experimental data, has been proposed to contribute to the progression of diabetic nephropathy in the hyperfiltrating diabetic kidney (31,32⇓). Glomerular hyperfiltration and hypertension are associated with glomerular hypertrophy in the remnant kidney model and in the diabetic kidney model. It has been suggested that glomerular hypertrophy also concur to the occurrence of glomerulosclerosis (33), by raising glomerular wall tension (34) and by stretching and damaging the glomerular epithelial cells (35). As shown in the present study and in previous studies by other groups (2,5⇓) and by ours (8), the kidney of the obese patient shares functional abnormalities with the diabetic kidney such as renal vasodilatation and hyperfiltration, rendering it susceptible to damage. It is noteworthy that the decrease in the area under the glucose curve after weight loss was a predictor of the changes in GFR. However, this finding does not necessarily imply a cause and effect relationship between impaired glucose tolerance and hyperfiltration, and it may reflect the fact that both improve independently following weight loss. In the present study the elevated RPF and GFR decreased after weight loss. Given the fact that the number of glomeruli remained unchanged during the study, this change reflects a decrease in single-nephron plasma flow, and single-nephron GFR. The decrease in RPF suggests that the glomerular afferent arteriole became less dilated, thus transmitting a lower pressure to the glomerular capillary bed. The resulting decrease in capillary hydrostatic pressure is even more prominent because systemic arterial pressure also decreased. Thus, capillary hydrostatic pressure decreased by two mechanisms: a decrease in systemic arterial pressure and an increased afferent arteriole resistance. This decrease in capillary hydrostatic pressure is expected to diminish GFR. In addition, a decrease in RPF may affect GFR independently of changes in hydrostatic pressure: this decrease is predicted to raise the intraluminal concentration of macromolecules as blood flows axially along the glomerular capillaries (36). This results in an increase in the glomerular intracapillary oncotic pressure, thus lessening the forces favoring glomerular ultrafiltration. It is noteworthy that GFR decreased in all subjects in the present study; in contrast, RPF did not decrease in two of the subjects. The reason for the discrepancy between the change in GFR in all subjects and the lack of decrease in RPF in these two subjects is unknown. In one of these two, RPF was in the normal range before weight loss, a fact that may explain the lack of change after weight loss. However, this finding is consistent with the fact that GFR may change irrespective of variations in RPF. Finally, the fractional excretion of albumin decreased following weight loss. The mechanisms linking glomerular hemodynamic alterations and the fractional clearance of albumin are uncertain. An increased fractional albumin clearance may be theoretically due to either impaired size- or charge-permselectivity properties of the glomerular membrane or to decreased tubular catabolism of albumin. The study of glomerular sieving coefficients of dextran molecules of graded size showed that microalbuminuria is not due to a size-selectivity defect (37). Thus, the increased albumin excretion rate may be due to either a glomerular charge-selectivity defect or to decreased tubular catabolism. Recent studies suggest that an increased glomerular pressure may increase albumin excretion rate by affecting glomerular cell metabolism: stretching of mesangial cells by increased pressure (38–40⇓⇓) increases the production of TGF-β, which may impair the lysosomal enzyme activity in tubular cells (41,42⇓). This leads to increased urinary albumin excretion independently of an altered glomerular permselectivity, as shown in a model of hypertension-induced albuminuria (42). Furthermore, an increased albumin excretion rate in the nondiabetic patient may be the result of systemic endothelial dysfunction, independently of local glomerular hemodynamic alterations. Obesity is associated with endothelial cell dysfunction (43–47⇓⇓⇓⇓), which is one of the factors accounting for the increased cardiovascular morbidity in the obese population (48,49⇓). It is thus possible that the decreased albuminuria after weight loss reflects a beneficial influence of weight loss on the integrity of the systemic capillary network. Notwithstanding the pathogenesis of albuminuria in the obese subject, the decreased fractional albumin excretion after weight loss reflects improved glomerular and/or systemic capillary function. The improvement in glomerular hemodynamics after weight loss, shown in the present study was associated with a decrease in BP that correlated by multivariate analysis with the change in GFR. Reisin et al. (50) have shown that weight loss in overweight hypertensive subjects results in a decrease in BP and that this decrease is independent of a reduction in salt-intake. Hall et al. (51) showed in an experimental model that obesity is associated with marked sodium retention. Hall (52) hypothesized that the increased tubular reabsorption of sodium results in decreased delivery of salt to the macula densa, which leads to glomerular arteriolar vasodilatation and to increased RPF and GFR. This hypothesis provides a link between obesity-associated hypertension and hyperfiltration. The decrease in GFR and arterial pressure after weight loss is compatible with this hypothesis. However, this hypothesis remains to be proven. This study was performed in obese individuals without overt renal disease. Hyperfiltration may be implicated not only in the pathogenesis of obesity-related glomerulopathy, but also in the progression of other glomerulopathies. A recent study demonstrated that IgA nephropathy progresses more rapidly in obese subjects than in lean patients (21). This finding and the results of the present study suggest that weight loss may favorably alter the course of chronic renal insufficiency by reducing the obesity-associated glomerular hyperfiltration. Thus, considering the increasing prevalence of obesity (22) and obesity-associated renal disease (20,21⇓) the findings of the present study have important theoretical and practical implications. In summary, weight loss improves the glomerular hemodynamic abnormalities associated with severe obesity in subjects without overt renal disease. These findings suggest that weight loss may delay the progression of renal insufficiency in obese patients with glomerular disease. We thank Chaim Chaimoff, MD, Department of Surgery A, Rabin Medical Center-Golda Campus, for his help in recruiting the patients.